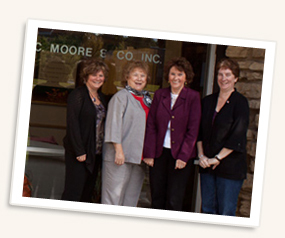 C Moore & Company Inc.
C. Moore & Company Inc.
We offer a wide variety of Accounting, Tax and Financial products and services to both individuals and business, please click on the Services menu link for more information. We are located at 700A Willow Lane in West Dundee, view map for directions. To keep you better informed, we will routinely post important tax information, IRS updates, news, tips and recent developments. Please check back as we will be updating this content regularly. Let us know if you have any questions, comments or concerns. Affordable Care Act - "Obama Care"
Reporting rules for the income tax return. Feel free to call us if you have any questions. Did you have full coverage through employer, Medicare, medicaid for the entire year? YES - Full coverage need 1095 - B or C.
NO - Continue to step 2. Was coverage through the exchange? NO - If insurance was paid personally we need to know the amount paid each month for each dependent. If you did not have any insurance coverage during the year please let us know that so we can calculate the penalty. - If you signed up on the exchange you will receive form 1095-A before January 31, 2017. This form will be required in order for us to complete the income tax return. - If you received an exemption we will need the certificate number to report on the tax return as well. Organizers are now available. Please send us an email at or call the office (847) 426-9444 to request your copy. After careful consideration, we have chosen to support PADS of Elgin. PADS is a homeless shelter located in Elgin that services the Elgin- Dundee area. We visited the shelter and seen first hand the needs that they have. For more information or if you want to see ways you can help visit their website at www.padsofelgin.org. Copyright © 2011-2019 C. Moore & Company, Inc. Website design by Blue Door Media. All Rights Reserved.